Rowland Langmaid (1897-1956). 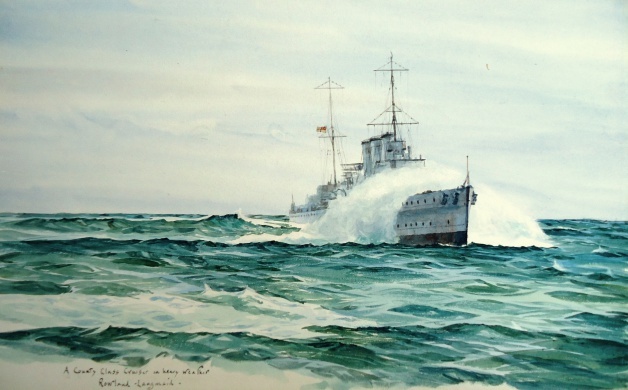 Watercolour inscribed in artist's hand "A County Class Cruiser in heavy weather" and signed Rowland Langmaid. Undated. Another competent and very attractive watercolour from the brush of Lieutenant Commander Rowland Langmaid RN. There were 13 County Class heavy cruisers (including two for the Royal Australian Navy) built between 1926 -1930. With an overall length of some 630 feet and displacing around 10,000 tons they mounted eight 8 inch guns, carried one catapult launched aircraft and could knock up around 31 knots when newly out of dry dock with a clean bottom! Rowland Langmaid had left the Royal Navy after the First World War. Already a well known artist within naval circles (he painted in oils, watercolours and etched too), once retired he took up painting and etching as a full time occupation and his works duly caught the eye of Admiral Sir Andrew Cunningham who, on his appointment as Commander-in-Chief Mediterranean early in World War 2, had Langmaid appointed to his staff as official war artist. During this period Langmaid travelled widely throughout the Mediterranean theatre recording the routine work and the failures and triumphs of the Mediterranean Fleet with a healthy collection of pictures, many of which were reproduced in two books published after the war. One or two of these paintings do occasionally re-appear at auction houses or picture galleries and are eagerly snapped up by collectors but most of them it seems have gone to ground although the etchings are more widely seen. Whether this undated watercolour originates from the wartime period or an earlier one is uncertain though an apparent absence of any radar aerials or enhanced searchlight batteries or hastily added AA weapons around the upper deck suggests that this is a painting of the cruiser in the inter-war years. Lack of paravane chains over the bows, other ships in company and the fact that the jack and ensign staffs are still rigged reinforces the belief that this is almost certainly a ship not at war.